If you have received a letter or notice from the Internal Revenue Service indicating that you owe money or their intent to levy or audit, we highly recommend that you seek the advice of a Certified Public Accountant. 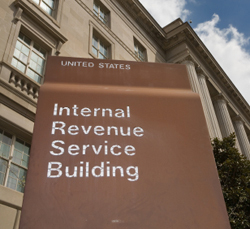 The team at Bergman Hirsch Spilfogel & Tyman, CPAs has extensive experience representing both individual and business clients in front of the IRS. We can provide you the protection you need and require. There are many reasons why the IRS may have selected your return for audit or review. It is crucial that your first response is timely and appropriate. At Bergman Hirsch Spilfogel & Tyman, CPAs we custom tailor strategies to handle your individual situation. Whether your file was selected at random or specifically targeted, how you respond may affect the outcome. The IRS has their team of Revenue Officers, Revenue Agents, and Special Agents highly trained in all aspects of Internal Revenue Code; you should have your own team of highly trained experts to represent you. Without proper representation, you could end up paying more than you have to. In extreme cases you could be subject to criminal charges. Before the IRS performs their audit of your records, we will perform our preliminary audit in-house in order to anticipate problems that the IRS might find. Then we will develop strategies to mitigate and contain them. All new clients will receive a free overview of their prior years returns. All information exchanged will be kept strictly confidential. Broward: Hallandale, Hollywood, Dania Beach, Fort Lauderdale, Sunrise, Oakland Park, Lauderdale Lakes, Lauderhill, North Lauderdale, Lighthouse Point, Sea Ranch Lakes, Pompano Beach, Deerfield Beach, Margate, Coconut Creek, Parkland, Coral Springs, Weston, Plantation, Tamarac, Cooper City, Davie, Pembroke Pines, and Wilton Manors. Miami-Dade: Aventura, North Miami, and North Miami Beach. Palm Beach: Boca Raton, Delray Beach, Boynton Beach, Lantana, Lake Worth, Highland Beach, Hypoluxo, Manalapan, West Palm Beach, and Palm Beach.